Depending on which dining room you choose, the 1st floor a smaller more casual room or the top floor still casual with marvelous views of the ocean and a more extensive seating area, the menus are interchangeable. I opted for the upper level, merely to enjoy the beauty of the day. For this outing I chose items from the casual menu, starting with the KG’S BLT. 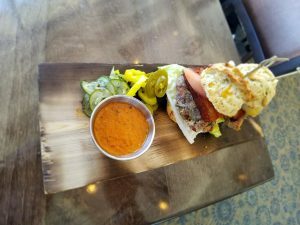 Stacked full with Smoked and Fried Chicken Boneless Chicken Thigh, Jalapeno Cheddar Drop Biscuits, Picked Green Tomato, Remoulade, Pork Belly and Butter Lettuce. Two nicely sized offerings, perfect for sharing or as a meal for one. I found the chicken moist and smoky which is a preference for me. 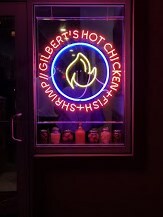 The biscuits were generously stuffed Jalapeno pieces, adding a nice bit of heat, and if you know about or have eaten at any of the other “Gilbert’s” then you are already aware of how spectacular the Pork Belly is and today was no different. 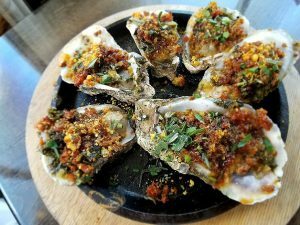 I spotted the work Foie Gras on the menu and immediately ordered the Broiled Gulf Coast Oysters, slathered with generous amounts of the Foie Gras Butter, Pomegranate Molasses, Andouille Sausage Gilbert’s Greens, finished off with Corn Bread Gratin. Warm and salty oysters a perfect bite, a dish I would order again. I was going stop, but my server was very persuasive in steering me to the Southern Curry. Usually, I would not touch Collards, but when Chef Gilbert turns them into a velvety well-spiced broth who am I to resist. I opted for the Chicken with this dish it was the right choice. The texture and sweetness of the Coconut rice tempered the heat from the curry and the Chilies. 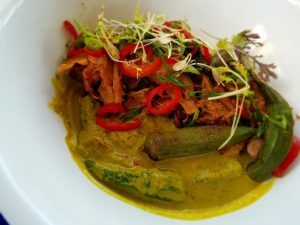 This dish with its simple ingredients provided me with many textures and flavors to ponder. Again this is a dish I would like to remain on the menu.